Ever see standup paddlers jump over their paddle and land it!? Ever wanted to try it, but you were afraid of looking stupid or just plain injuring yourself? “Sometimes I have this problem where I can’t imagine myself being able to do something, so I don’t try it. It might be to avoid looking stupid. It might be to avoid hurting myself ( I like to think this has saved me on number of occasions). Sometimes, it is a little of both. The paddle jump would be one of those “a little of both” situations. I have seen countless people attempt the paddle jump over the years, and I have witnessed some pretty hard crashes… even inflatable boards don’t feel that soft when you are face planting on one. When I would think about trying the jump, I would have visions of my foot catching on the paddle and my hands forgetting to let go as I crumble helplessly face first, before my dramatic roll into the water. Well, a couple of months ago, I decided to push my fears aside and finally try it out. I am sure there are the super elite athletes out there who could pull this off on a super slim carbon board, but I wasn’t willing to try that just yet. I opted for my Imagine Inferno, a board designed for SUP yoga. It’s inflatable, which provides for a more forgiving landing, and is nice and wide (37″). 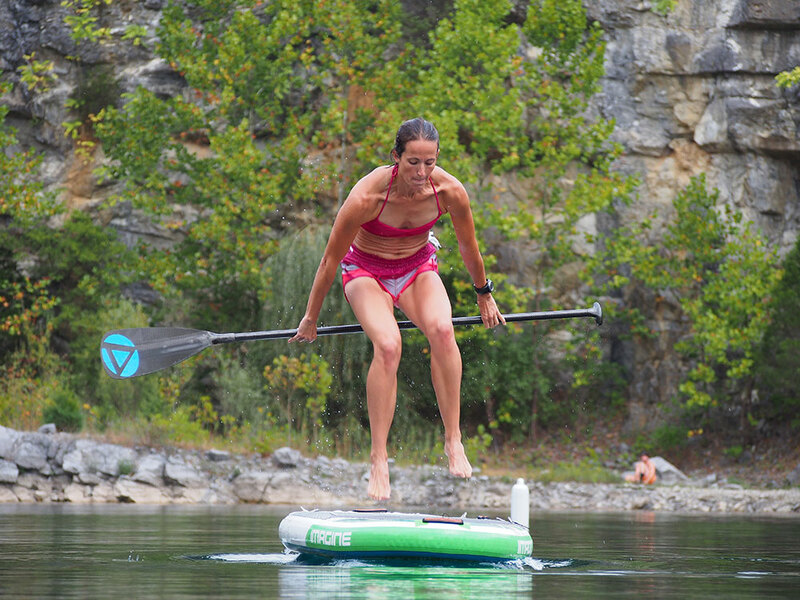 Practice jumping over your paddle while jumping OFF your board for the first few tries. Stand facing the side of your board, as shown in the picture below. As you can probably guess, this picture does not depict a successful jump. I am pretty sure I banged my shin pretty hard on this try. Try to jump straight up in the air, as high as you can, and slap your thighs against your chest. If you hear a slapping sound, you are probably doing it right. Make sure you keep a nice LOOSE grip on the paddle. Failed attempts are a lot less painful if you remember to let go of the paddle. When you land, thinking about landing with your feet shoulder width apart (so nice and easy on a wide board) and try to stomp your feet as you land. When you land, immediately look up. Just as you are taught when you are learning to paddle board, it is easier to balance looking out at the horizon, then at your feet. I look down for the jump, because I want to see where I am landing, but as soon as I land it, I try to look up… note the word try. I’m still working on that one too. My last piece of advice is this, don’t try to jump over the paddle, try to pass the paddle under you as you are jumping. This will keep you centered on the board as opposed to jumping forward and landing on the nose. Jump as high as you can and slap your knees to your chest. Pass the paddle under you, don’t try to jump over the paddle. Keep your feet about shoulder width apart when you land. Stomp the landing so you get both feet down at the same time.